Hastings United's footballers will continue their pre-season friendly scheduled tonight (Tuesday). United will host neighbours Westfield in the sixth of their seven warm-up games ahead of the 2016/17 Ryman Football League Division One South campaign. U's manager Darren Hare says all first team players will get some minutes and a few youngsters will also feature against a Westfield side which plays in Macron Store Southern Combination Football League Division Two. Kick-off at The Pilot Field is 7.45pm, and admission is £4 for adults and £2 for concessions, with under-18s going free. 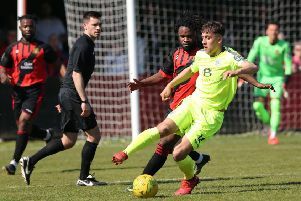 United’s final friendly is at home to Havant & Waterlooville on Saturday and they will begin their league programme with a visit from South Park seven days later. A few players are carrying knocks at present, but Hare expects them to be fit for the league opener. In other United news, the club has been drawn away to Herne Bay in round one of the Ryman League's Alan Turvey Trophy, sponsored by Robert Dyas. The match is due to be played the week commencing Monday August 22. Bexhill United, meanwhile, will conclude their pre-season schedule with an away game against Eastbourne Town tonight. Kick-off at The Saffrons is 7.45pm.